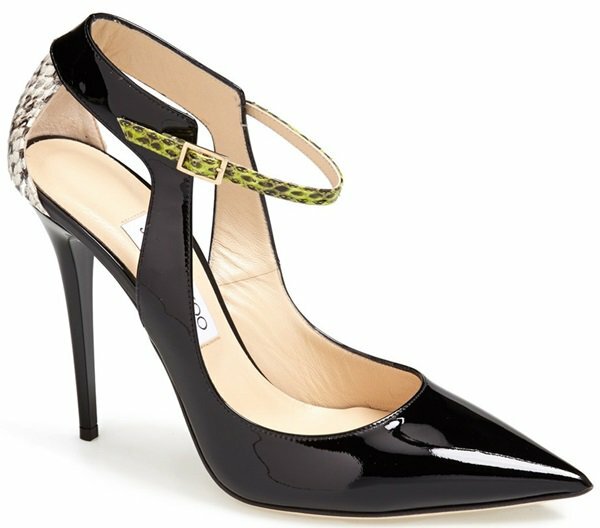 Allison Williams has been busy since we last featured her in Christian Louboutin “Air Chance” slingback pumps at the People’s Choice Awards. This week, she helpfully showed us what toe cleavage is all about. First, the American actress, comedienne, and musician attended Diane von Furstenberg’s Journey of a Dress Exhibition Opening Celebration on Friday along with Abbie Cornish, Ahna O’Reilly, and Bella Thorne. Allison wore an Amelia wrap dress from the Diane von Furstenberg Spring 2014 collection styled with white leather Jimmy Choo “Maiden” pumps (available at Nordstrom). The 26-year-old once again hit the red carpet on Saturday for the 2014 Sean Penn & Friends Help Haiti Home Gala benefiting J/P HRO. For this event, she donned a daring dress from the Osman Fall 2103 collection featuring a gold embroidered front panel. Allison styled the sleeveless cocktail dress with Christian Louboutin “So Kate” pumps in mirrored bronze leather (available in black at Barneys). Which of the two ensembles do you think looked better on Allison? Visit our Allison Williams, Christian Louboutin, and Jimmy Choo pages for much more!